is allied to the Diss Grammar School Facebook group. School Sports and Sports Days. At the top are some images and further down sports day programmes. use your browser's BACK / ARROW button to return here. You can also view, zoom and download the photos on Google Drive. 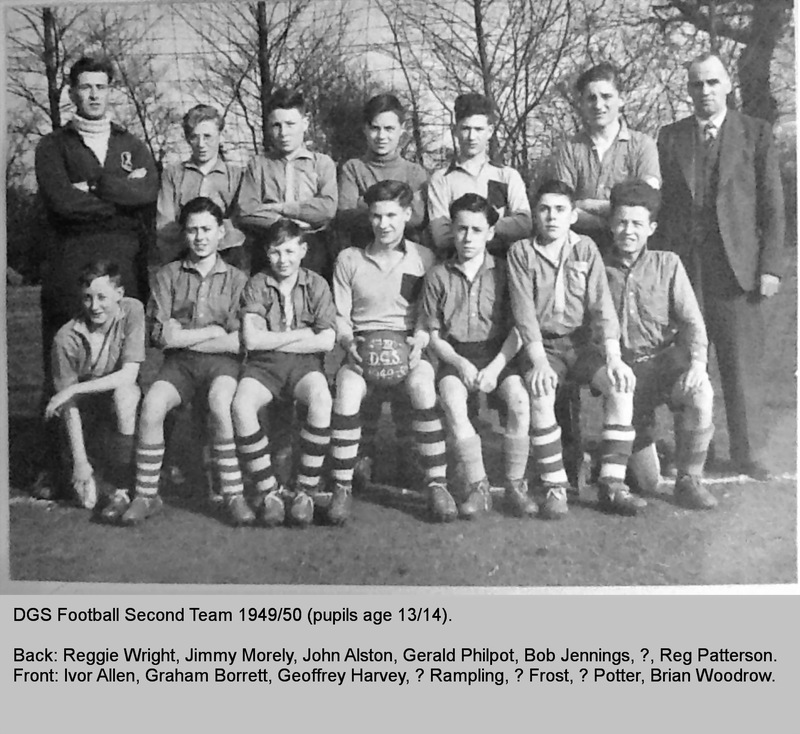 Back row — Reggie Wright, Jimmy Morely, John Alston, Gerald Philpot, Bob Jennigs, ?, Reg Patterson. Front row — Ivor Allen, Graham Borrett, Geoffrey Harvey, , ? Rampling, John(?) Frost, Bernard(?) Potter, Brian Woodrow. 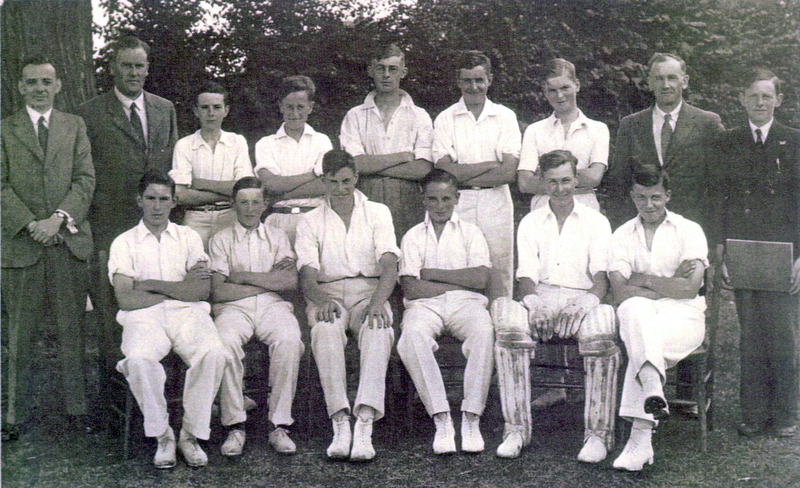 Back row — Rob Bloom, ?, Jim Lawn, 'Googie' Withers, John Alston, Geoffrey Harvey, ?, Pete Jones, David Bryant, R. G. Patterson, David Coote. 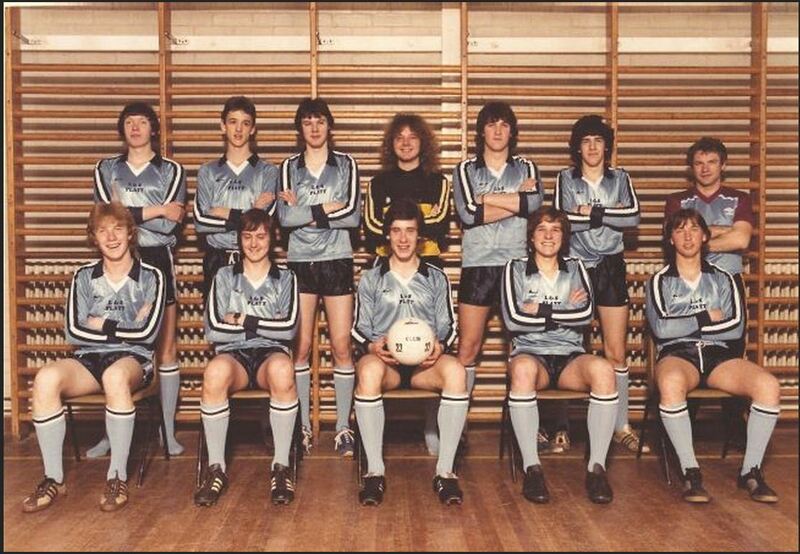 Front row — ?, (Peter) Butcher (twin), Bob(?) Jennings, (John) Butcher (twin). 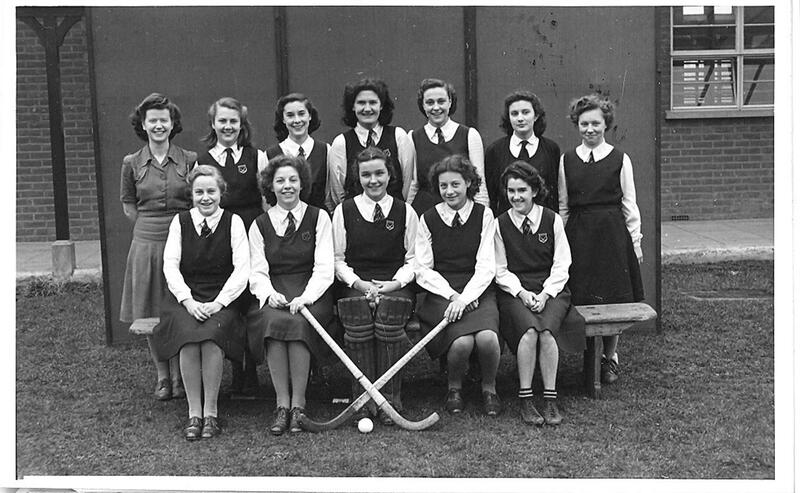 Back row — Rosemary Moorecroft, ?, Jennifer Mullenger, Miss Johnson, Jean Bullock, ?, Christine Locke. 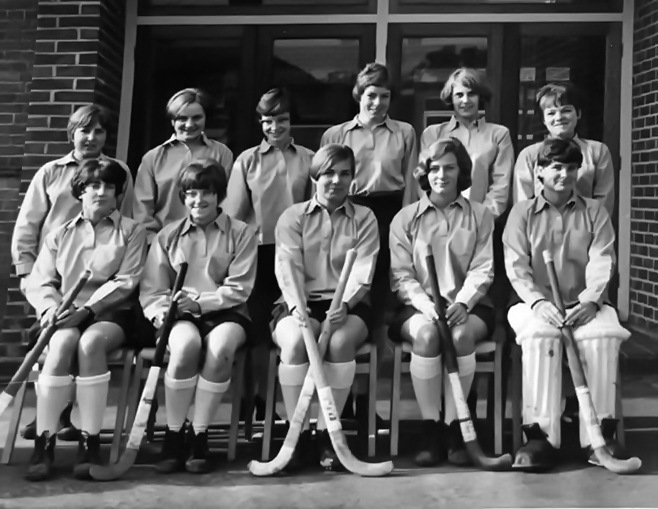 Front row — June Allen, ?, Jill Boggis (? ), Janet Patterson, Kathleen Brown. 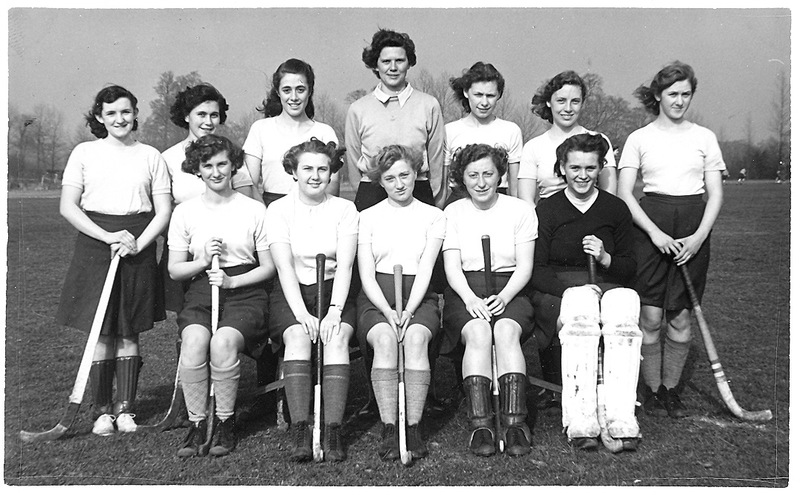 Back row — Sarah Bartrum, Jane Govier, ?, ?, Jackie Hosford, Beverley Gilbert. Front row — ?, Sonia Fieblekorn, Judith ?, ?, Clare Beattie. 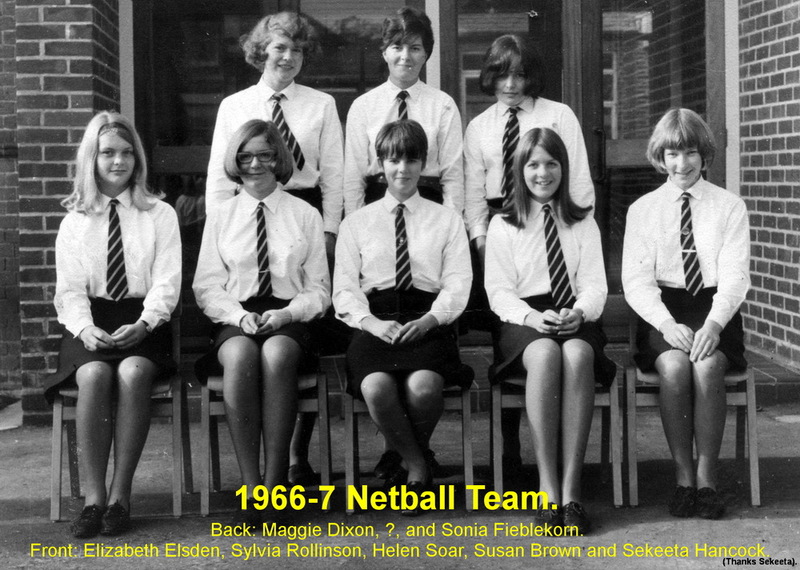 Back row — Maggie Dixon, Pat Coles (? ), Sonia Fieblekorn. 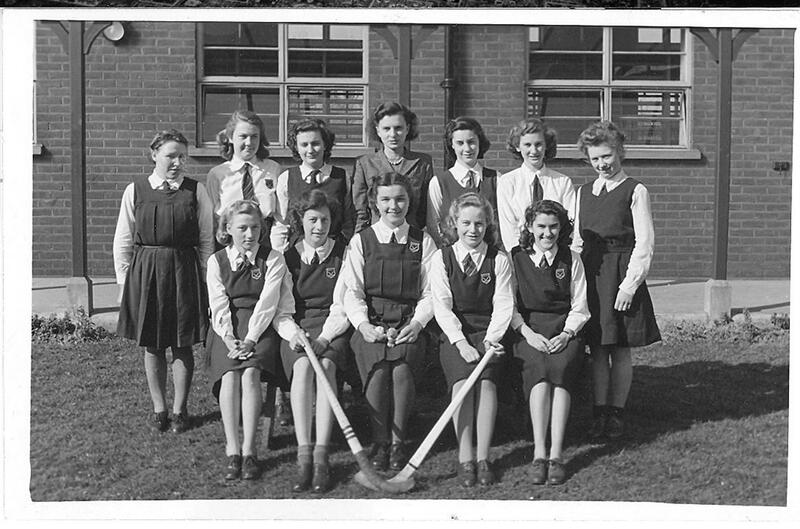 Front row — Elizabeth Elsden, Sylvia Rollinsin, Helen Soar, Susan Brown, Sekeeta Hancock. Sailing took place on Filby Broad for learners and Barton Broad for the more experienced. It was a voluntary weekend or school holiday activity. 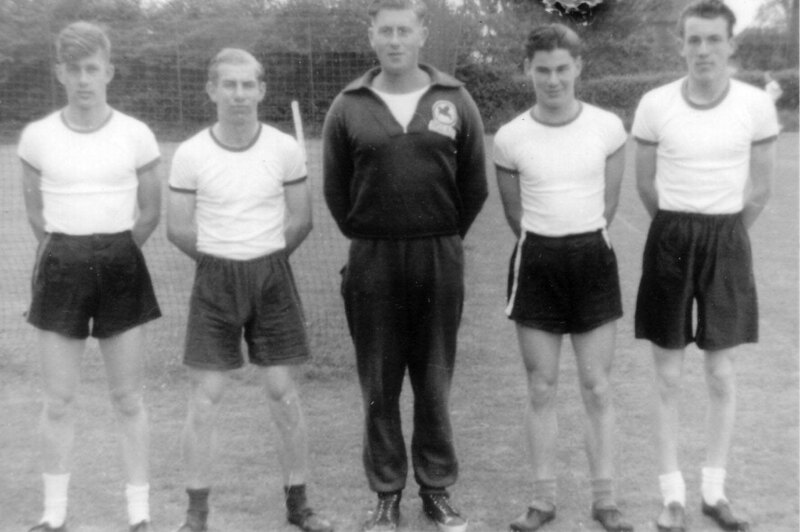 John Blagden, 'Dewberry' Daniels and Reg Wright were the tutors. * The Bittern Dinghy was designed to a commission from the Norfolk Schools Training Association for a training dinghy. Approximately 60 were produced. Bermuda Sloop Fractional with jib. A Bittern class* wooden boat, sailing dinghy. It was made at school in the winter of 1960 led by Bob 'Oboe' Aberdein (woodwork teacher). We then sailed it until summer 1980. 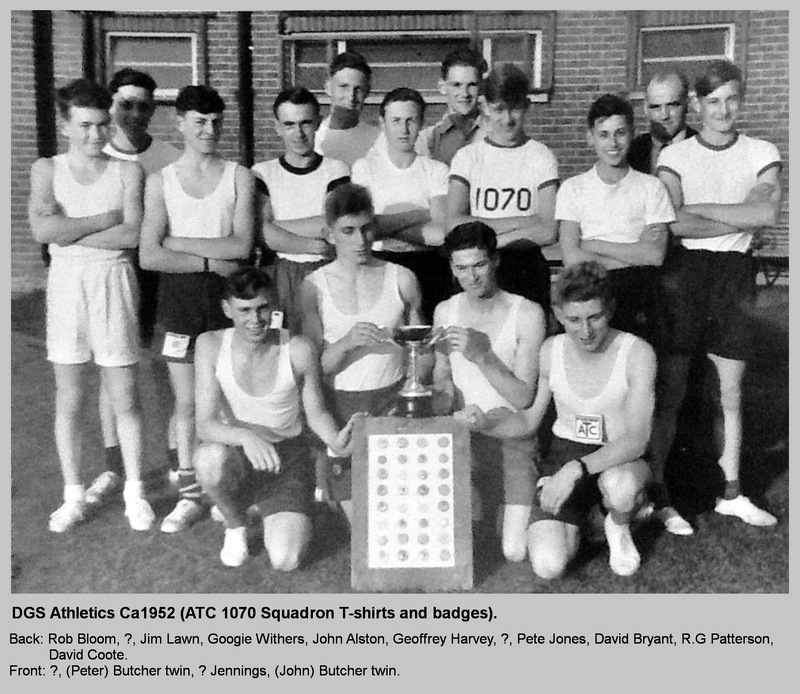 When Eye came over they brought their dinghy, a 12' international Cadet, we used both until the Grammar School finished, although we only had one trailer. 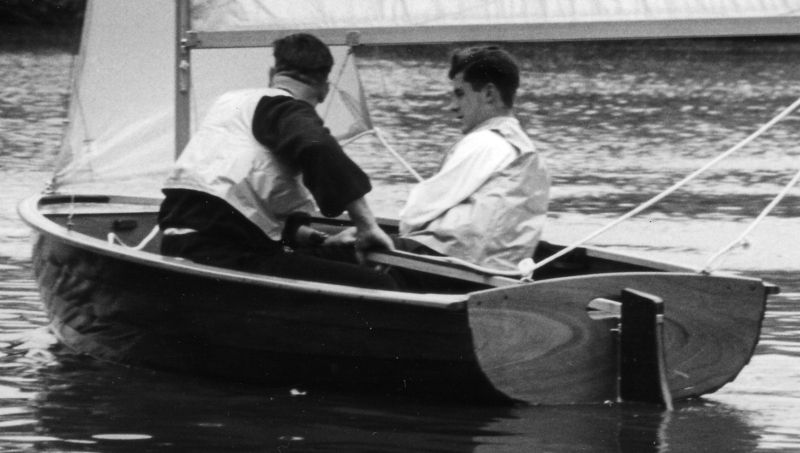 The management of the High School felt that they were no longer of interest, especially as the Norfolk Schools' Sailing Association had a permanent base at Filby Broad with a fleet of boats already there, that could be used by any school, as long as they had qualified instructors. The Cadet was a popular junior boat with many sailing clubs so could easily be sold, the Bittern was only of limited interest. 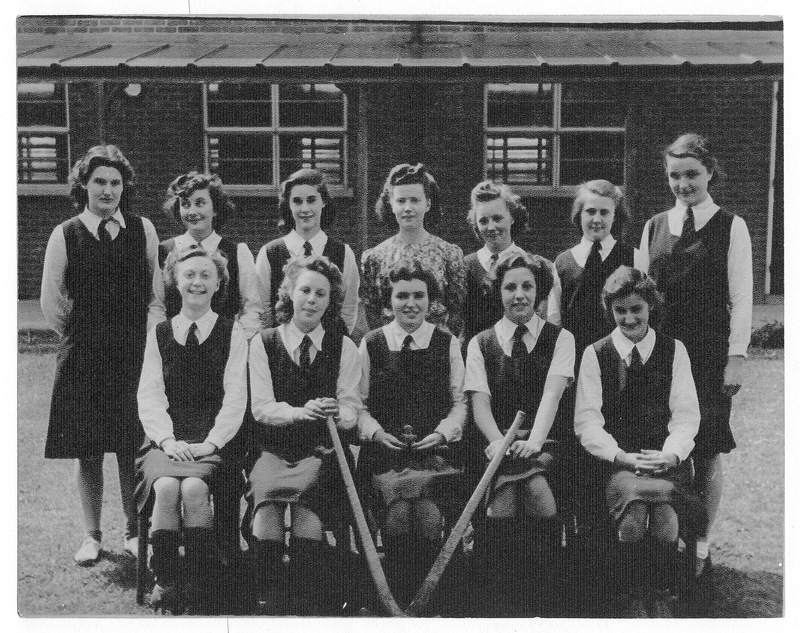 At that time Jill Blagden (domestic science teacher) was the County Outdoor Activities Advisor for Norfolk Girl Guides so she arranged for them to buy it, without the trailer. The trailer was not needed once we had taken it to their canoeing/sailing base. I (John Blagden maths and physics teacher) bought the trailer for myself as my own was clapped out. I towed my own boat quite a lot although she was based at the Oulton Broads Sailing Club. The Dyssean was renamed Lady Mayhew. Lady Mayhew was President of the Norfolk Guides, and also a keen and successful sailor herself, particularly of the old 'Norfolk Brown Boats'. As it says in your cutting (see above left) after some 20 years of use by the guides she needed a lot of work doing, particularly with regard to the centre board housing. 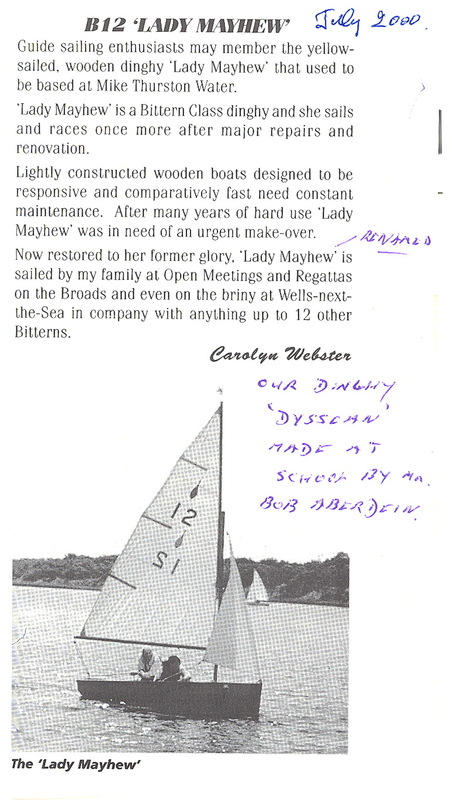 An Old Dyssean, Sandra Elliner, who had learned to sail in her herself, kept me in the picture. 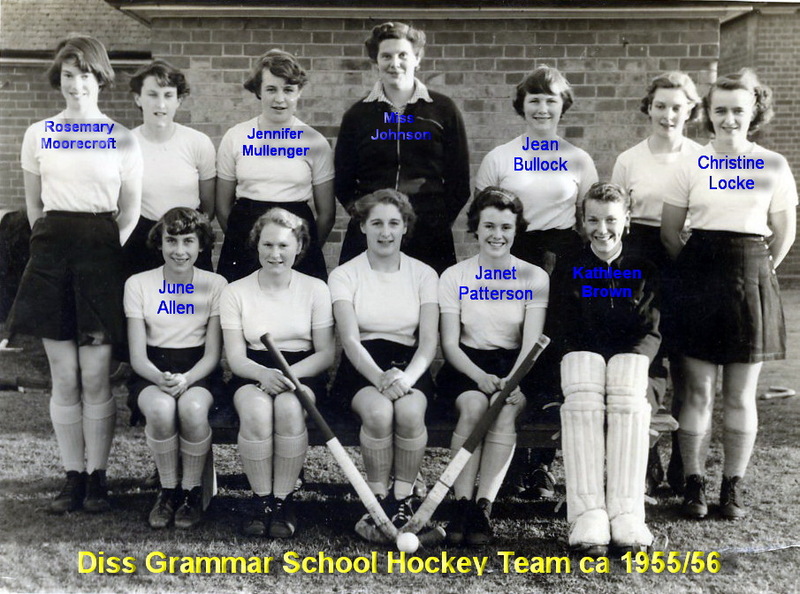 She was well able to do this as she was the Norfolk County Girl Guides' canoeing instructor. By John Blagden Jan 2012. 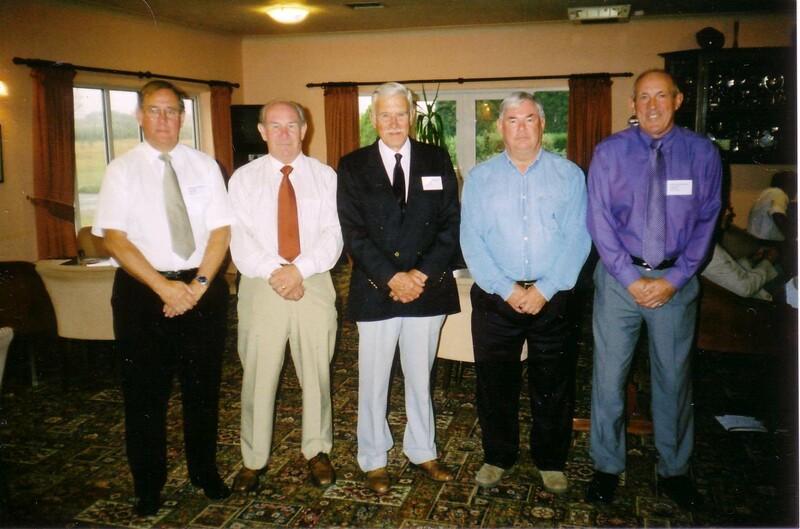 Peter Jones, Ray 'Ramon' Button, Reg Wright, Barry Skipper, David Hawes.